Delhi and its Greens: A woody affair! It is said about cities that if we listen carefully, a city speaks and narrates its story to all those who consider it their own. Delhi is no different and a rendezvous with the city reveals its glorious past and a heritage of green spaces, some of which were preserved even before the Mughals ruled the city. Delhi is also referred to as the city of antiquity and is believed to be one of the oldest continually inhabited cities of the world. Delhi’s green heritage was kept alive even by the Britishers during the time that England ruled the country. Not only were the existing green spaces upgraded but new parks, gardens, etc. were also planned through out the city. Such is the glory of Delhi that the building of New Delhi was actually an attempt by the British to lay claim to India’s past and show their unfaltering determination to maintain the British rule in India. Getting back to the present day, Delhi’s green spaces are being choked and the very trees that have been cherished by the generations gone by are being cut without batting an eyelid. All this is being done in the name of ‘development’ and in order to make Delhi a ‘world class city’. Lately however, the city has already been facing an identity crisis of its own. People from all over the country have been migrating here in search of better opportunities and with the latter being their primary objective they pay little, if any, attention to the city. As the green cover is displaced and trees removed from where they once stood in their full glory, the city is fast losing its ambience such that it may soon become alien to the few who can still relate to it. At the same time, the ‘world class cities’ to which Delhi is being compared neither even remotely share the history and culture of Delhi nor have they had any considerable green heritage. In fact, Delhi is a one of its kind city that can neither be compared to nor should be compared with! 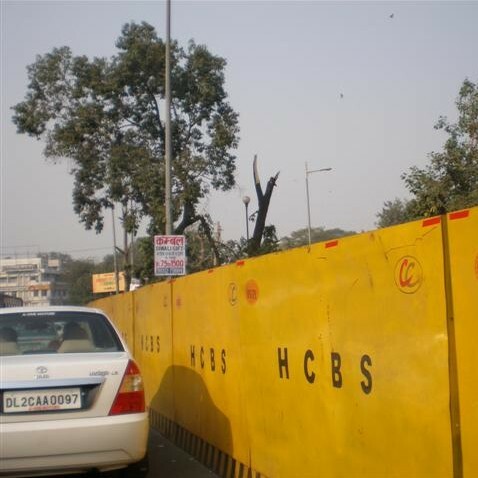 At the Daryaganj-Ambedkar Stadium Red Light, trees have been extensively removed for the HCBS corridor. Likewise in several other parts of the city. Several thousand trees have already been felled in the city to make way for flyovers, the Delhi Metro and various road widening projects. Though the environment clearance process ensures that some form of compensatory afforestation is carried out by the said project proponents, this is usually done kilometers away from where the trees have been cut. Thus, well spaced and strategically located trees are removed and replaced with a cluster of tree saplings – planted in a very small and usually isolated area far away from the people who were benefiting from the felled trees. This also leads to the formation of urban heat islands within the city where the temperature on a hot summer afternoon will always be a few degrees above that of its surroundings. Besides, another drawback of the compensatory afforestation programme is that we can only plant saplings that “may” go on to become trees over a period of eight to ten years. This may not make much difference to us but is actually a matter of life and death for the large number of biodiversity – birds, insects, etc. that survive on the trees being felled. We certainly can’t freeze them in time waiting for the “planted” trees to mature and sustain them. 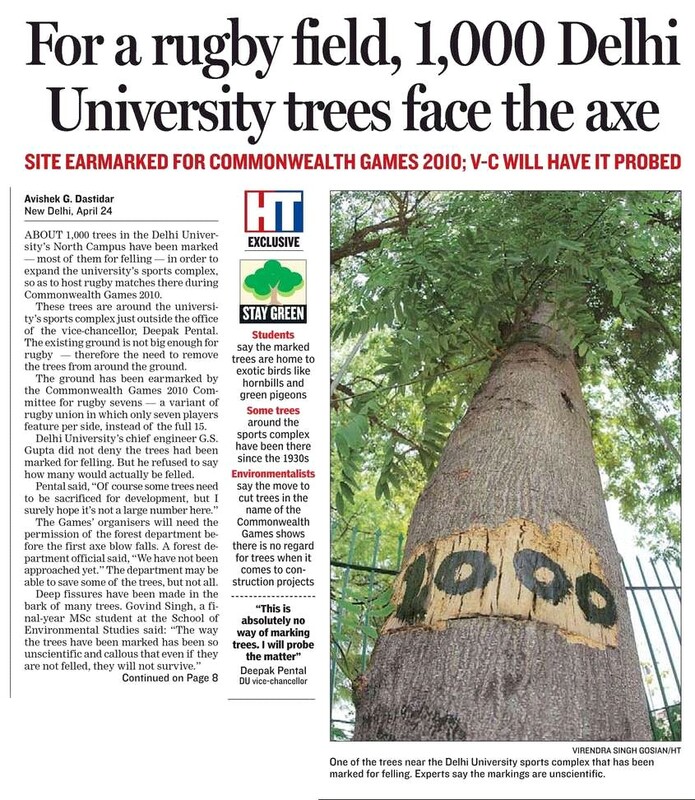 For instance, the proposed rugby stadium to be constructed at the University of Delhi Sports Complex could require over 1000 trees to be cut (‘For a rugby field, 1,000 Delhi University trees face the axe’, Hindustan Times; Front Page Story – April 25, 2007). This will irreversibly change the campus’ environment and also result in a permanent loss of a lot of biodiversity that will disappear from the University. Moreover, the fact that Delhi Metro’s Environment Impact Assessment (EIA) report states the average cost of one tree to be Rs. 700/- speaks for the unconcern of the project proponents towards the large number of ecosystem services provided by the trees. Amidst all of this, what is always forgotten is that Delhi is known as a ‘city of greens’ world over. On a recent visit to the city, to address the eighth Rajiv Gandhi Memorial Lecture, Nobel laureate Prof. Wangari Maathai declared that she had never been to a more green city before. Such is the experience she took back to her country and such is the perception everybody has about Delhi. Any attempt to change this will only lead to a city that neither the tourists nor its citizens can relate to. London always bangs on about being the greenest city too! Concrete is no substitute for wonderful green spaces and large proud, wildlife supporting trees. You could start a ‘save our trees campaign’ by printing those words onto ribbon and getting people all over Delhi to tie them around tree trunks. I saw resp. Wangari Maathai on PBS last night and truely related to what she did and spoke about. Last couple of years I have been yearning to do something about planting trees. Are you aware of organizations or resources on the web that point to the basics on working towards a greener world, especially India, since the flora and fauna would most likely be different for different parts of the world. Is it working with forest dept or nurseries and getting local community and/or school/college kids to help in planting saplings? Is there a resource that lists such local communities? ?